Ayodhya Dharam Sabha Live Updates: The Vishwa Hindu Parishad (VHP) is organising 'Dharma Sabha' in Ayodhya and other parts of the country to press on the Modi government to take ordinance route to begin the construction work of Ram Mandir. Ayodhya Live Updates: The Vishwa Hindu Parishad’s (VHP) Sharam Sabha commenced in Ayodhya on Sunday afternoon with its international general secretary Champat Rai declaring that no formula dividing the disputed land will be acceptable and that they want entire 2.77 acre of plot for Ram Mandir. Addressing the Sabha after the inauguration marked by chanting of mantras and lighting of lamp, Rai said, “We want the entire land for temple construction…no formula dividing the land is acceptable.” Rai’s assertions are seen in reference to the Allahabad High Court’s 2010 verdict dividing the land into three parts. The court had ruled by a majority verdict that the land be divided equally into three parts among Hindus and Muslims and that the place where the makeshift temple of Lord Ram exists belongs to Hindus. Former VHP leader Pravin Togadia said Sunday that Prime Minister Narendra Modi failed to enact a law for the construction of Ram temple at Ayodhya despite the BJP having a full majority. He was reacting to Modi's statement earlier in the day alleging that Congress threatened Supreme Court judges with impeachment when they tried to hear the Ayodhya dispute. "After sixteen years ofenjoying power, twelve years as Gujarat chief minister and more than four years as prime minister, Modi spoke about Ram temple," Togadia said, referring to Modi's speech at Alwar in Rajasthan. Prime Minister Narendra Modi alleged on Sunday that the Congress threatened Supreme Court judges with impeachment when they tried hear the Ayodhya dispute cases earlier this year. Without naming anyone, Modi claimed that Congress party's Rajya Sabha members, who are also lawyers, had tried to scare away the apex court judges to ensure the hearing in the cases is delayed until after the 2019 Lok Sabha election. "What is happening in Ayodhya right now is nothing but another attempt by the BJP and the Sangh Parivar to whip up communal frenzy, instigate violence and then use the bloodshed to polarise voters to benefit the party in the 2019 elections," alleged Bhim Army chief Chandrashekhar Azad. The Yogi government has announced its plans to install in the temple town a 221-meter statue of the Maryada Purushotam, taller than the Statue of Unity of Sardar Vallabhbhai Patel. While the "Statue of Unity", presently the world's tallest, installed in Gujarat's Narmada district on the 143rd birth anniversary of Patel, is 182 metres high, the one to come up in Ayodhya will be 221 metres. While the height of the Ram statue will be 151 metres, its overhead umbrella would be of 20 metres height and the pedestal would be of 50 metres, Principal Secretary Information Avnish Awasthi said. RSS chief Mohan Bhagwat said that people should press the ruling government to find out ways to build a Ram Temple in Ayodhya. "Anyone can tell reasons why Ram Temple can't be built, but we have to find out the reason why and how it should be built," Bhagwat said. Bhagwat further added that Indian society wants a Ram Temple to be built in Ayodhya. The All India Muslim Majlis-e-Mushawarat (AIMMM) on Sunday wrote to President Ram Nath Kovind, seeking his urgent intervention into the developments in Ayodhya, where the VHP has organised a public meeting to press for construction of a Ram temple. An umbrella body of more than a dozen Muslim religious and social organisations, the AIMMM said in its letter that the presence of "unruly mobs" in Ayodhya is a clear pointer to the way things are moving in an unchecked manner in Uttar Pradesh. The All India Muslim Majlis-e-Mushawarat (AIMMM) on Sunday wrote to President Ram Nath Kovind, seeking his urgent intervention into the developments in Ayodhya, where the VHP has organised a public meeting to press for construction of a Ram temple. Addressing the sabha after the inauguration marked by chanting of mantras at the Badey Bhaktmaal ki Bagia, Ramji Das said:"The date for construction of the Ram temple will be declared in the 2019 Kumbh which will be held in Prayagraj". "It is only a matter of few days, and I request you all to show some patience," the seer remarked. 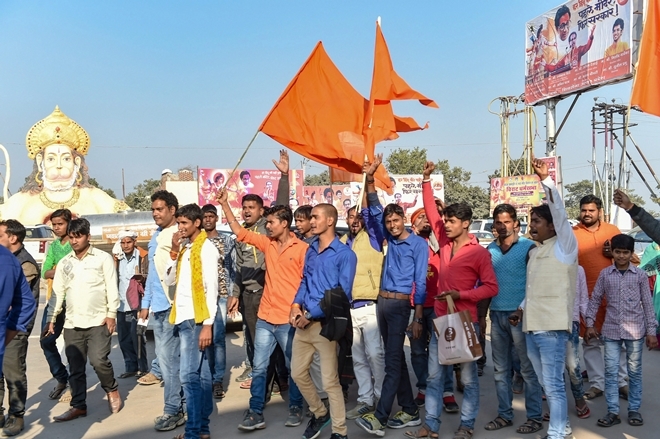 Posters of VHP's 'Dharam Sabha' and Shiv Sena chief Uddhav Thackeray's programme in Ayodhya are splashed across the streets of the temple town, and many religious 'akharas' have turned into debating venues to discuss the issue of Ram temple. Hordes of activists of both the VHP and the Shiv Sena, who have gathered here from various parts of the country, bear saffron flags and chant 'Jai Shri Ram'. In the background posters with images of Lord Ram and the slogan 'Chalo Ayodhya' dot the roads. At many places, passers-by can see small trucks carrying projectors and a screen to showcase 'Ramayana', a famous 1986 TV series. Police has turned the city into a fortress with multiple layers of security that include the deployment of drones. One deputy inspector general (DIG), one additional DGP, 10 additional SPs, three senior superintendents of police (SSPs), 21 deputy SPs, 160 inspectors, 700 constables, 42 companies of PAC, five companies of RAF, ATS commandos and drones have been deployed. VHP's international general secretary Champat Rai said that "we want the entire land for temple construction...no formula dividing the land is acceptable." The remark comes as the outfit's 'Dharma Sabha" commenced in Ayodhya. Rai added that no formula dividing the disputed land will be acceptable for temple construction. Shivpal Yadav meets Governor Ram Naik. He has asked him to suspend Uttar Pradesh government if it fails to maintain communal harmony. Shivpal had recently founded Pragatisheel Samajwadi Party (Lohia). The Vishwa Hindu Parishad's 'Dharma Sabha' is being touted as the largest congregation of 'Ram bhakts' in Ayodhya since the 1992 'kar seva'. The outfit has claimed that over 3 lakh people have arrived in Ayodhya to attend it. The congregation is happening less than two weeks ahead of the 26th anniversary of the demolition of the 16th century Babri Mosque. The incident had triggered unrest in Ayodhya and riots in other parts of the country. The streets of Ayodhya are filled with right-wing activists who have poured in from various parts of the county for a VHP's Dharam Sabha to push for construction of a Ram Temple. VHP national spokesperson Vinod Bansal informed that RSS chief Mohan Bhagwat will address VHP's 'Dharma Sabha' in Nagpur today at 4 pm. BJP MLA Surendra Singh on Sunday attacked Shiv Sena chief Uddhav Thackeray over his Ayodhya visit. In his remark, the Ballia MLA said that Shiv Sena is trying to hijack the issue. "The people who thrash north Indians and drive them out, who don’t even have the mentality to serve humanity, how will they serve Lord Ram?" he asked. Senior Congress leader Mallikarjun Kharge said that parties are going to Ayodhya because of the elections. He questioned why Uddhav Thackeray had not visited Ayodhya before. "Who stopped Uddhav Thackeray from going there in past 4-5 years?" he said. "On one hand, they're friends with BJP and on the other, they want to tell people they're interested in constructing Ram Temple and are putting pressure on the government. People won't be befooled," he said. VHP's national vice-president Champat Rai addressing gathering in Ayodhya. The Dharam Sabha of the VHP is presided by RSS Sarkaryawah Krishna Gopal. H said that 'some intelligent people of this country need to be reminded that issue of Ram temple didn't end on December 6, 1992'. DIG Ayodhya, Omkar Singh, said that all arrangements are in place for VHP's programme. "We have allotted spaces for parking, bypass is running smoothly and we will ensure it stays like that. ‘Darshan’ will be from the usual routes. We will do everything in an organised way." Uttar Pradesh Deputy Chief Minister Keshav Prasad Maurya on Sunday disapproved of ally Shiv Sena's push for Ram Mandir. According to a PTI report, he said that the party had no role in the temple movement. Maurya said that there is no problem in Uddhav Thackeray catching a glimpse of Ram Lalla, but had Balasaheb Thackeray been alive, he would have prevented Uddhav from doing whatever he is doing. “The Shiv Sena had no role in the temple movement or even in the Dharam Sabha, though Balasaheb Thackeray would support the Vishwa Hindu Parishad,” he said. BJP leader and MoS for Externak Affairs VK Singh slammed Samajwadi Party president Akhilesh Yadav for his remark that Army should be deployed Ayodhya. Singh said that whenever BJP comes to the power, no riots happen. “Akhilesh Yadav ji should sit silently”. Attacking the BJP, Thackeray said that former PM Atal Bihari Vajpayee had said that Hindus won't be beaten but today the people want to ask when will you construct the temple. “When you (BJP) scrapped Rs 500 and Rs 1,000 notes, did you go to a court? Then why for Ram temple?” he asked. Do whatever you can. Things like TripleTakaq and demonetisation were also done by this government, they did not go to court with it. If this government doesn't construct Ram Mandir, then this government may not stay. But the Ram Mandir will still be constructed, Shiv Sena chief Uddhav Thackeray said. Uddhav Thackeray said that saints who blessed me yesterday, I told them that the work which we are about to begin can't be done without their blessings. I have no hidden agenda in coming to Ayodhya. I have come to express sentiments of all Indians and Hindus across world. All are waiting for Ram Temple. Uddhav Thackeray rules out any hidden agenda behind his Ayodhya visit. He said it is wrong to connect his visit to 2019 general elections. He added that Hindus across the world want a grand temple as early as possible. Uddhav Thackeray said that when he visited the Ram Lalla temple in the morning, he was saddened to see massive security arrangements there. Shiv Sens supremo Shiv Sena told reporters that his visit to the Ayodhya is successful and thanked his supporters and state government for their support. He said that the party wants early construction of the temple at the same piece of land where Babdi Masjid once stood. According to multiple media reports, the party is believed to have sent around 3,000 supporters by two trains from Maharashtra. According to local administration, number of devotees visiting Ayodhya to pay obeisance to Ram Lalla has dropped in the past few days. They said that this is because security concerns and the tension ahead of today's events. They claimed that on Saturday, 17,680 people visited the Ram Lalla temple and on Friday 49,112. According to a pamphlet that was recently released by the VHP, "Saugandh Ram ki khaate hai, hum mandir bhavya banayenge (We pledge in the name of Lord Ram that we will build a grand temple for him)." They have urged devotees to be a part of the movement. 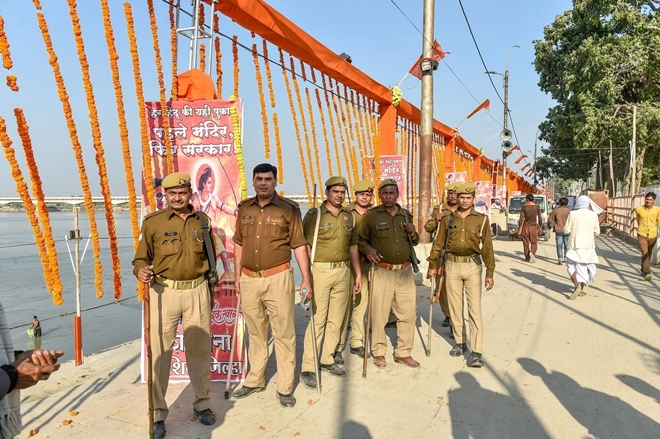 According to VHP leaders, Ram temple supporters and Hindu devotees from around 50 districts of Uttar Pradesh have been mobilised for the show of strength. Senior VHP leaders including its international vice-president Champat Rai are camping in the temple town. The 'Dharma Sdistricts abha' is likely to begin at 11 am. According to police, close circuit cameras have been installed at more than 150 places in Ayodhya along with drone-mounted ones hovering over the streets to keep an eagle eye on the surging crowds. CPI-M general secretary Sitaram Yechury slammed the VHP and Shiv Sena saying the campaign is and attempt to nullify the provisions relating to secularism in the Constitution. He said that the the party is strongly opposing the efforts to subvert the judicial verdict on the Ayodhya dispute. "The Sangh brigade cannot be allowed to subvert the Constitutional provisions in the name of faith," a report in News 18 quoted him as saying. Thane: Shiv Sena supporters perform 'Maha Aarti' ahead of the ram Temple event to be held in Ayodhya tomorrow, in Thane, Saturday, Nov. 24, 2018. (PTI Photo)(PTI11_24_2018_000132B)The Vishva Hindu Parishad was founded on August 29, 1964 on the auspicious day of Shri Krishna Janmasthami. The objective of this organisation is to consolidate the Hindu society and serve, protect the Hindu Dharma.